Vhavenda, like other African nations, believed in the existence of a Supreme Being long before the arrival of European missionaries. The Vhavenda name for God was/is Nwali (Mwali). He was also known as Raluvhimba. Vhavenda believed that Nwali/Raluvhimba was a universal god and that he was the only creator of mankind on earth. They therefore referred to Him as Musika Vhathu or Mutumbuka Vhathu (creator of mankind). Nwali was the provider of rain which Vhavenda depended on for their survival. He was also the protector and defender of Vhavenda. It was believed that Nwali used to visit his people and that his arrival was preceded by the sudden cracking of thunder up to the sky. The people would look up in the sky, ululating and dancing while welcoming the arrival of Nwali. In 1917 a meteor, which bust during daytime, made a thunderous noise along the Soutpansberg mountain range and led to people believing that Nwali was visiting Venda. Vhadzimu are ancestors. According to Vhavenda cultural standards, ancestors are those people who died at a mature age or as parents. Ancestors are not on the same level as Nwali, and are not in competition with Nwali. It is believed that every mortal human being is a sinner and that human beings have no right to communicate directly with Nwali, who is holly. Living beings can only send their messages to God via the ancestors since ancestors are immortal beings and are no longer capable of sinning. Ancestors are intermediaries between Nwali (God) and mortal beings. Ancestors deliver people’s prayers, offerings and messages to Nwali. They also deliver Nwali’s blessings and messages to living beings. So, the offerings that are performed to venerate, to appease, to make offerings to the ancestors, to thank Nwali, or to ask for blessings, are a way of maintaining the relationship between living beings and the ancestors to ensure that prayers and offerings are delivered to Nwali and that Nwali’s blessings are received. But Westerners misunderstood this relationship and referred to the sending of prayers to God (Nwali) via the ancestors as ancestral worshipping. 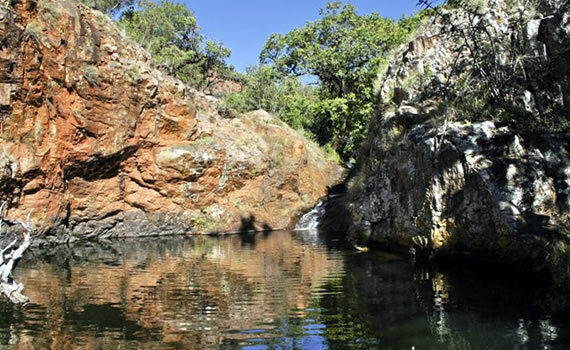 There are numerous sacred sites in Venda, referred to as Zwifho and Zwitaka. Some of the zwifho are regarded as Zwifho zwa Nwali (Nwali’s Shrines). Tshifhe (priest) is the only person allowed to receive messages from Nwali and to communicate people’s wishes to Nwali. Each shrine had its own Tshifhe. The best known Nwali shrine is at Makonde. This is where Tshifhe Muhulu (senior priest) resided. Oral history has it that the Makonde shrine was established by the Vhambedzi. The Vhambedzi kingdom stretched from Masvingo, Zimbabwe to Vhumbedzi, North-Eastern Venda. The Vhembe River (Limpopo River) was never a barrier between the people living on either side of the river. The Vhambedzi royal kraal was in Malungudzi (Marungudzi in Karanga) in Masvingo. The Vhambedzi were renowned rainmakers. The first Vhambedzi group to settle in North-Eastern Venda settled at Zwaluvhimbi, Ha-Makuya. From there the group settled at Ha-Luvhimbi and Makonde. Later the group split into two: Tshisinavhute and Luvhimbi. The Tshisinavhute group moved to Mianzwi, while the Luvhimbi group remained at Ha-Luvhimbi. It is believed that the two groups split due to the fact that Tshisinavhute, wanted to be chief but Luvhimbi would not allow her to be one. 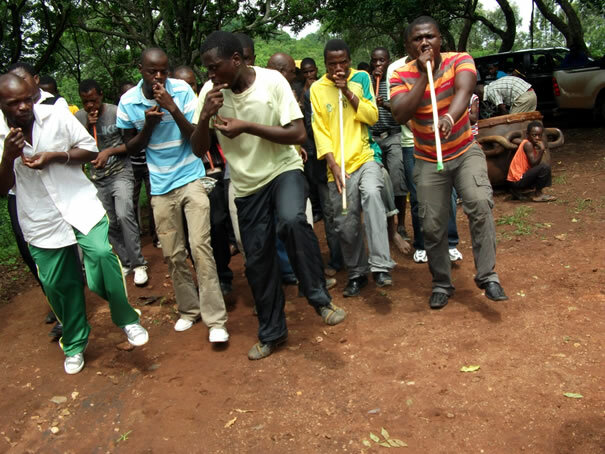 The two Vhambedzi groups paid tribute to the King in Malungudzi. But later on great distances and the disintegration of Vhambedzi settlements led to the establishment of small autonomous groups at Ha-Luvhimbi and Mianzwi, and other lesser-known units at Ha-Mukununde, Tshikweta, and Masetoni. But whenever the South African Vhambedzi failed to cause rain to fall, they would send their messengers to Malungudzi where the Malungudzi Mbedzi would contact Nwali on behalf of Vhambedzi south of Vhembe. When Ravhura fled from Dzata after Tshisevhe’s assassination, he settled at Makonde which was under Khosi Muthivhi. Ravhura became the new Khosi of Makonde. The Nwali shrine had already been established when Ravhura settled at Makonde. Nwali continued to visit Makonde and to communicate with Vhavenda from Mount Makonde even after Ravhura had settled at Makonde. The other shrines which were visited by Nwali on his way to and from Makonde were at Ha-Tshivhula, Mudzivhadi (a few kilometres north of Makhado town), Donwa at Ha-Matsa, and Madindini a Nwali at Tshitangani (next to Lake Fundudzi). The Tshivhula shrine was found at Mavhambo, west of the Soutpansberg mountain range (where the Soutpansberg range starts). The area was under Khosi Tshivhula whose jurisdiction included present day Vivo, Waterpoort, Mapungubwe, Alldays, and Musina. The Tshivhula community (Tshivhula/Sebola, Lishivha, Mulambwane and Machete) was forcibly removed from their land by successive Boer and apartheid governments. Some settled at Mufongodi (Straightheart) in Nzhelele, while some settled at present day Marobyane, Kromhoek, De Vrede, and Ga-Kibi. The Donwa shrine at Ha-Matsa was, like most Venda shrines, a Ngona shrine and had been established long before the Singo conquest. Senior Singo chiefs and kings were not allowed to enter the Donwa shrine. Mashovhela Rock Pool. Mashovhela – the place where drums can be heard. Mashovhela is one of the most sacred places in Tshivenda culture. This sacred site is still used by diviners and vhotshifhe (priests) in rain-making ceremonies. The owners and custodians of the different sacred sites are Mukwevho clan (Luvhola), Nethathe clan (Thathe Holy Forest), Ramunangi clan (Phiphidi Waterfalls), Nemungadi clan (Mungadi), Nevhutanda clan (Vhutanda), Nekhwevha clan (Khwevha), Netshiavha/Netshiheni clan (Lake Fundudzi), and Mamphwe clan (Tshiswavhathu Pool). The Mount Songozwi site, found at Songozwi village, is where the Ramabulana-Mphephu chiefs and kings, and Sinthumule and Kutama chiefs are laid to rest. All Ramabulana-Mphephu kings, from King Makhado to Dimbanyika Thohoyandou II, and all Sinthumule and Kutama chiefs, from Sinthumule I and Kutama I, have been laid to rest at Songozwi. Venda’s sacred sites are under threat from developers and unscrupulous business people. Some mahosi (chiefs) have in recent years decided to develop areas where sacred sites are situated without consulting and seeking permission from the custodians of the sites. A good example is that of Phiphidi Waterfalls where the Tshivhase Development Foundation Trust tried to turn the site into a holiday resort. The Tshivhase Development Foundation Trust is an organisation registered under the name of Khosi Midiyavhathu Kennedy Tshivhase and the Tshivhase Traditional Council. The Tshivhase Development Foundation Trust started developing the area where the sacred site is situated without consulting the Ramunangi clan, the owners and custodians of the site. The Ramunangi clan was barred from visiting the site and performing religious rituals. The Ramunangi clan, with the assistance of Dzomo la Mupo (a local NGO that supports local communities in preserving their culture and protecting the environment), obtained a court interdict against the Tshivhase Development Foundation Trust in July 2010. But the Tshivhase Development Foundation Trust ignored the interdict and continued with the illegal development. The Ramunangi clan went back to court in February 2011 and obtained another interdict. The development at Phiphidi Waterfalls was finally halted in July 2011 after the court ordered the developers to stop developing the area. According to the Ramunangi clan, tradition dictates that the clan should gather at Phiphidi Waterfalls every year in September to perform religious rituals. Preparations include the brewing of mpambo (sorghum beer brewed for religious rituals) which is drunk by all clan members prior to the pilgrimage to the sacred site. Then on a night chosen by the elders, following signs a such as mist, a selected group of spiritualists accompanies the senior makhadzi (the clan’s senior aunt) to the sacred site to perform rituals which are kept secret from the rest of the clan. When they are done with the rituals, they hear sounds such as the beating of drums and tshikona music coming from under the water. The whole area is covered in mist. That is a sign that Nwali has heard their prayers and it will rain. And when it rains, all the people of the land, not only the people of Ramunangi, benefit. Dzomo la Mupo wants mahosi and business people to respect zwifho and zwitaka, the same way they respect churches, mosques, temples, and synagogues. It warns that violating sacred sites could lead to severe droughts and untold miseries being visited upon innocent people. According to Dzomo la Mupo, sacred sites are places where evaporation that leads to rain occurs. If pools such as Phiphidi Waterfalls are not protected, there would be no rain. City Press – 6 March 2011. The occurrence of a solar eclipse, Mutshakavhili, in Venda was/is regarded as a visit by Nwali. People were not allowed to watch the event since it was believed that Nwali would be passing all over Venda on His way to His shrine in Makonde. It was believed that Mutshakavhili happened when Nwali was angry and that He had visited Venda to tell His people what He was not happy about. After the solar eclipse had passed, Vhotshifhe (chief priests) would go to the cave on Mount Makonde to find out why Nwali was angry and what needed to be done to rectify the mistake and to pacify Nwali. After a meeting with Nwali, Vhotshifhe would deliver Nwali’s message to Khosi of Makonde village. The Khosi of Makonde would then have the responsibility of passing on the message to the king of Venda. The king would then order chiefs to call people in different areas to attend special gatherings and to explain to them why Nwali was angry and what needed to be done to pacify Him. People in different areas would then set dates for religious ceremonies, thevhula. Mpambo would be brewed for the ceremonies. Bulls would be sacrificed on the day(s) of the ceremony and religious rituals would be performed to ask for forgiveness. Vhotshifhe would then deliver Mpambo, food, and anything that Nwali requested to the different shrines in Venda. All the offerings had to be placed at the entrances to the shrines. They would then wait to see if Nwali had accepted their apology. Fires would then spring from the shrines and consume all the offerings. Vhotshifhe would then go back to the villages to deliver good news. Thereafter people would feast and tshikona would be performed. Nwali would then leave Mount Makonde and visit the other shrines on His way back to Malungudzi.